MMOBomb has been informed by Perfect World that the expansion has been delayed. During maintenance, the developers uncovered an issue on the back end that stopped the deployment of the patch. PWE will be posting updates on the expansion’s status on the Facebook page. 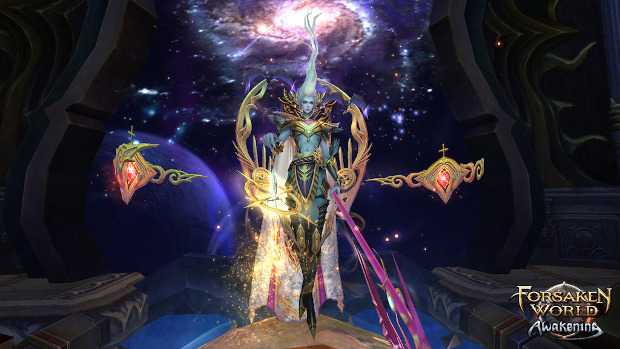 The 16th Forsaken World expansion — Awakening — is now available to play. The most recent update to the free-to-play MMO adds new content, a level cap increase, and more. Level Cap Increase – The game’s level cap has been increased from 90 to 100, allowing players to receive new main story quests and earn EXP/Soul Power faster than ever. New Map: The Ever Abyss – Players can journey through the unexplored pits of the Ever Abyss, where they will battle arch-demons and their savage minions for rewards. Three New World Bosses – Eyrda’s forces must join together to battle against Awakening’s three new world bosses – Renkailao (the bone dragon), Apepeos (the winged snake), and Galal (the giant serpent). These powerful creatures will appear in the Ever Abyss 48 hours after each weekly maintenance and require at least 30 players to defeat them. New Elemental Relic System – Completing challenges may earn players an Elemental Relic, which can be upgraded in a new gear slot to increase stats or infused with a Relic Spirit to make characters even more powerful. New Gear Instances – Level 90 players can team up in parties of three to participate in Awakening’s three new gear instances – The Bottomless Inferno, Gorge of Bravery and Ruin of Calamities. New God: The God of Retribution – By participating in any of the Vengeance map events, players will be entered into a competition created by the God of Retribution. The player who has killed the most bosses within each server will gain the ability to transform into the God of Retribution for a limited time. Other Updates – Awakening also introduces new pets, mounts, attributes and gear, plus a new level for the Phoenix Order, Dragon Order and Faith Order. Those wanting to check out the new content can download the game via the official site. The Forsaken World Awakening expansion was and EPIC FAIL! Massive DC’s, broken quest links, and auto paths. Broken dedication quest (dedication quest are a big part of the game). The contact between the players and game developers didn’t stick around for the Fallout (a telling giveaway). The Awakening expansion should have taken a back seat to the pre-existing broken and unaddressed issues with this game. If in doubt, check out the ARC Forums website, under General Discussion, Awakening: Known and New Issues Mega-thread. 30 player to defeat that boss? No boss takes 30 people to beat? Unless it’s EB that’s because your fighting other guilds for the drops. No server has a 30 person player base? What server are you on? I can get 30 people in a raid easily. Out of the top 10 major guild. Thats easily a few thousand players.